Does the OECD Think That the South Should Rise Again? A post at Wonkblog earlier this month noted that a recent analysis by the Organization for Economic Cooperation and Development (OECD) of regional well-being across its member countries found that the U.S. South was “the worst place to live in the United States.” The OECD –as diplomatic as it is– did not say this in so many words, but Wonkblog reporter Roberto Ferdman pulled together the OECD’s state-level data for the United States and it would be hard to arrive at any other conclusion. For each of the 50 states and the District of Columbia, the chart below gives the OECD’s overall well-being score, which consolidates the organization’s nine separate measures, reflecting health, jobs, safety, environment, access to services, civic engagement, housing, education, and income. Possible scores ranges from a low of zero to a perfect score of 90. In the United States, the lowest recorded score was 50.7 for Mississippi and the highest was New Hampshire at 77.6. As Wonkblog highlighted, the chart shows a heavy concentration of southern states at the bottom –and the complete absence of southern states at the top. Ferdman writes: “The South, which performed the worst of any region in the country, is home to eight of the poorest performing states. Only Virginia was in the top 25. And just barely — it placed 22nd.” A similar pattern holds in the nine subcomponents of the OECD’s overall index. So, what happens if we take up Guthrie and Gurria’s suggestion to use the well-being measures “to gauge what policies work”? Well, the most striking feature of the Wonkblog chart and of the OECD’s regional data more generally is how at odds the performance of the South is with long-standing policy preferences at the OECD. The South is almost certainly the region of the world that has most embraced in principle and has most embodied in practice the policies promoted by the OECD. Relative to the rest of the rich world, the states of the South have among the stingiest unemployment benefit systems, the least unionized workforces, the lowest minimum wages, the smallest public sectors, the weakest employment protection laws, and the lowest taxes. By standard OECD analysis, the South ought to be a workers’ paradise. But, based on the indicators that Guthrie decribes as “cold, hard facts” for “policymakers and citizens looking to bring about change,” the South performs disastrously. To be fair, in recent years, the OECD has softened its stance on some of these issues, such as the minimum wage. And the OECD has long been a champion of increased investment in education, where the South also does poorly relative to the rest of the United States. But, is it too much to hope that the OECD would use these new regional data to rethink their policy recommendations? At least when it comes to the United States? 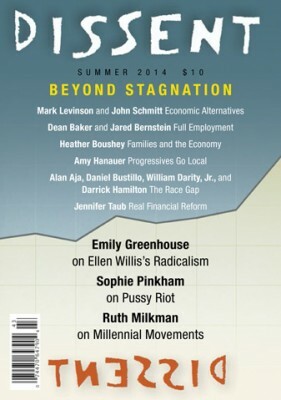 The September 2014 issue of New Labor Forum includes an article (paywalled) by Larry Mishel (President of the Economic Policy Institute), Heidi Shierholz (until recently an economist at EPI, now Chief Economist at the Department of Labor), and me offering our explanation for the rise in wage inequality since the end of the 1970s. The mainstream of the economics profession offers one over-riding explanation for the rise in inequality: workers who have the skills needed for new technologies have done well, while those lacking those skills have fallen farther and farther behind. …We take a different view. We believe that it is possible to explain the entire rise of economic inequality since the late 1970s as the outcome of an array of economic policies that had the easy-to-predict effect of widening the gap between the top 1 percent and the rest. Over each of the last three decades, macroeconomic policy (fiscal, exchange rate, monetary policies), trade agreements, deregulation of the financial sector, the legal environment governing unionization, the minimum wage, industry deregulation (in airlines, trucking, inter-state busing, and elsewhere), the privatization of state and local government functions, and other policies have had different effects on different kinds of workers, helping some and hurting others. … Together, we argue, these policies can explain changes in wage trends for workers—both men and women—across the wage distribution. The section features pieces by Dean Baker (CEPR) and Jared Bernstein (CBPP) on the importance of full employment; Heather Boushey (Washington Center for Equitable Growth) on the economics and politics of work-life balance policies; Amy Hanauer (Policy Matters Ohio) on progressive economic policy innovation at the state and local level; Alan Aja (Brooklyn College), Daniel Bustillo (Columbia University), William Darity, Jr. (Duke University), and Darrick Hamilton (The New School) on how to build a “race-fair” America; and Jennifer Taub (Vermont Law School) on how to fix our broken financial system. 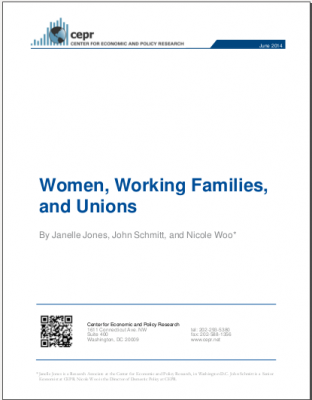 In advance of next Monday’s “White House Summit on Working Families,” CEPR released a report this morning that looks at the role that unions can play in improving work-life balance, particularly for women. My colleagues, Janelle Jones and Nicole Woo, and I start from the observation that the typical woman spends far more time in paid work now than she did three or four decades ago, but women still do the large majority of unpaid child-care, elder-care, and routine housework. We then document that women in unions not only earn more and are more likely to have health and retirement benefits, but they are also much more likely to have a host of family-friendly benefits including paid sick days, paid vacations, and paid family and medical leave. Given that one-in-nine women workers in the United States is in a union and women now make up just under half of all union workers, unions can play an important role in updating labor-market institutions to fit 21st century realities. 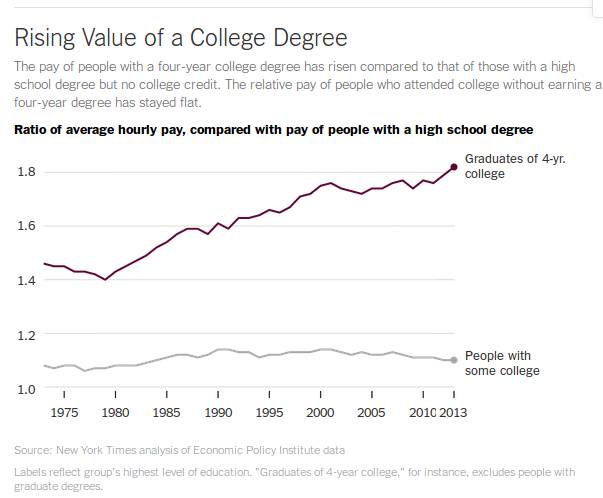 At the Upshot today, David Leonhardt asks if college is “worth it” and answers with a resounding “clearly,” citing data he obtained from the Economic Policy Institute. Leonhardt’s answer, however, raises a bigger question, which he leaves unexamined: if college is such a good investment, why aren’t more people making it? 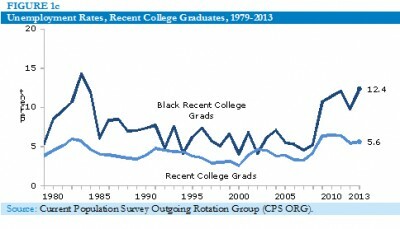 The data he presents show a big increase between 1979 and 2013 in the earnings of college graduates relative to high school graduates (the top line in the chart below). The gap, which has always been large, grew steadily for more than 20 years from the end of the 1970s into the early 2000s before slowing down in the 2000s. Leonhardt makes much of the uptick in the last couple of years, which puts the returns to college at an all-time high, but the growth in the college premium has clearly decelerated somewhat since about 2002, even with the finishing flourish in the chart. The chart, however, also poses a serious puzzle. Leonhardt concludes that: “from almost any individual’s perspective, college is a no-brainer.” If that is true, then, in a well-functioning market, we would expect that this extraordinary increase in the payoff to college would have led to a large increase in the supply of college graduates. In fact, as economists have documented for several decades now, the supply of college graduates decelerated at about the same time that the return to college started to increased. The share of college graduates in the workforce continued to grow after the early 1980s, but at a slower, not a faster, pace than it had in the 1960s and 1970s. Unless we think that the main reason young people aren’t going to college is because they don’t know that the average return to a college degree is very high (and always has been), then the much more interesting question is why it is that more young people aren’t going to college? Given the size of the returns to college –Leonhardt cites numbers from MIT economist David Autor that suggest that the present discounted value of college is roughly $500,000– the barriers must be substantial. First, as Heather Boushey and I (and, more recently, MIT economist Frank Levy and colleagues) have argued, not everyone who goes to college receives the average financial return. 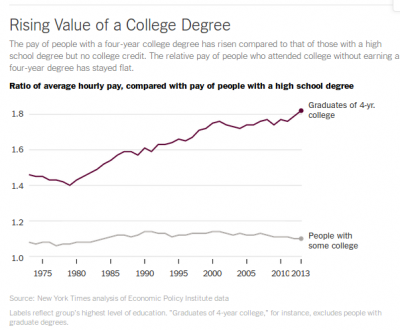 A non-trivial portion of college graduates earn less than the average otherwise comparable high school graduate. (In the current issue of Science, which the Upshot piece refers to, David Autor makes this same point: “Although the average college graduate earns substantially more than the average high school graduate, the least successful college graduates may earn substantially less than the median among high school graduates, and the most successful high school graduates may earn substantially more than the median among college graduates.”) At least some high school graduates on the fence about college might realistically expect –because of their grades, test scores, health situation, work responsibilities, or family obligations– that they will find themselves with a below-average pay-off to college. Second, as Heather and I also argued (and as Ben Casselman notes in a post today at 538), the big financial returns to college depend heavily on finishing your degree, but more than 40 percent of those who start college for the first time don’t finish within six years. Those who don’t finish have little to weigh against their lost earnings, lost years of labor-market experience, direct outlays in tuition and fees, as well as any student debt they might have acquired. Again, from the point of view of a young high school graduate considering college, knowing that there is a 40 percent chance that you will start, but won’t finish is pretty discouraging –again, especially if you have reasons to believe that you might more be more likely to be in the 40 percent than in the 60 percent. (Autor also makes this point in Science: “for students who acquire substantial student debt but do not complete the college degree, it is far from certain that college will prove a good investment.”). That I can identify, Leonhardt mentions only one reason that we don’t have more college graduates and does so only in passing. He quotes Autor as saying “we have too few people who are prepared for college.” But, if this is the main barrier to increasing the share of workers with a college degree, then we are in more trouble than Leonhardt seems to think. If we have not prepared enough young people to do college work, then we can hardly expect that these unprepared young people will finish college even if they start or that they will receive the high average returns earned by current graduates. 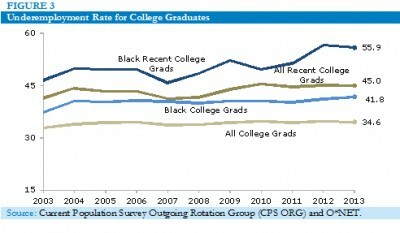 I may be wrong about why young people aren’t going to college in bigger numbers, and almost certainly there are other factors at play, but knowing why the young aren’t going to college in much greater numbers is a far more important question than knowing whether college is “worth it” “on average” and “all-else equal” for the people who have already gone. On his blog today, Paul Krugman has a nice shout-out to a report that Dean Baker and I wrote for CEPR way back in 2006. In that eight-year-old report, Dean and I made the point that, despite widespread crowing about the US “jobs machine,” 25-to-54 year olds (what economists sometimes call “prime-age” workers) were more likely to have a job in France than in the United States. 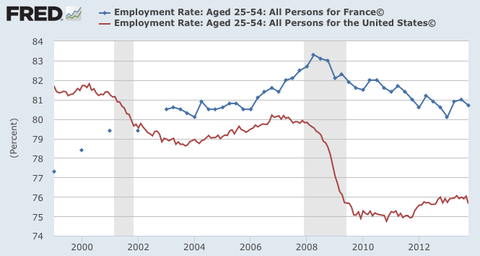 The French employment advantage among the “prime-age” population is much bigger now than in it was before the Great Recession. The same chart also shows that the gap between the two countries is narrowing slowly. US employment rates are creeping up. And French employment rates are falling steadily –dragged down by the weight of Europe’s deeply misguided commitment to economic austerity. 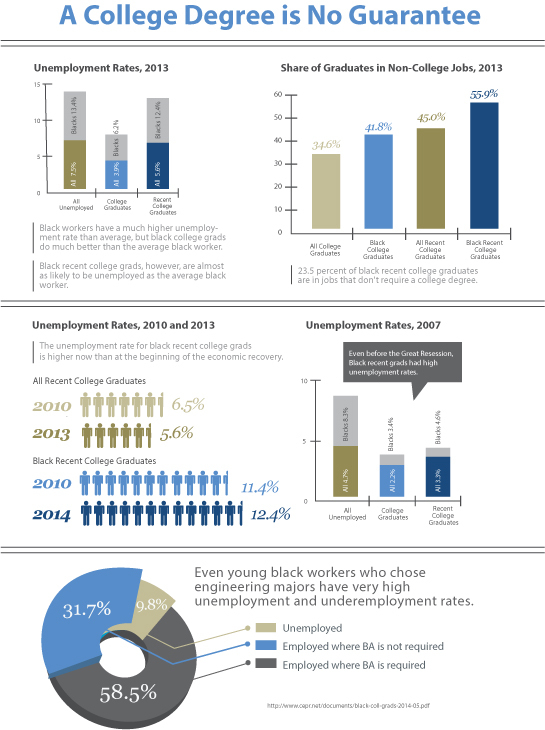 My CEPR colleagues Shawn Jefferson and Milla Sanes designed this excellent infographic to accompany our new report (pdf) on the labor market outcomes of black recent college graduates. 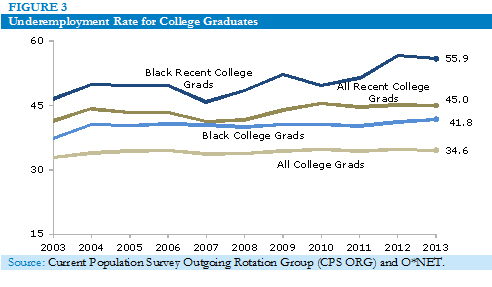 As Heidi Shierholz, Alyssa Davis, and Will Kimball have documented extensively in a recent report for the Economic Policy Institute, the Great Recession has been very hard on young college graduates. 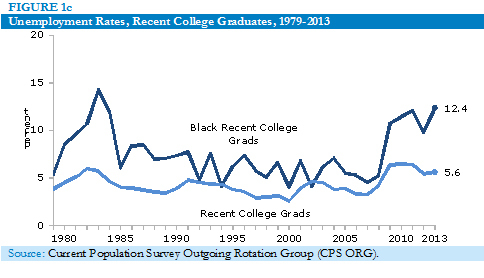 In a CEPR report released yesterday, Janelle Jones and I show that the tough economy has been even harder on black recent college graduates. The report has been written up already at Vox, the Wall Street Journal (once on the RTE blog, once in their Opinion section), ThinkProgress, and the Huffington Post. UPDATE May 30, 2014: More coverage of the report, including excellent stories in Al Jazeera America and The Atlantic, and a superb essay by Tressie McMillan Cottom at the Washington Post‘s new PostEverything page. Early on in his (rightly) highly complimentary review of Thomas Piketty’s Capital in the 21st Century, Paul Krugman declares: “This is a book that will change both the way we think about society and the way we do economics.” Krugman is certainly correct about the impact that Capital in the 21st Century will have on the way we think about the world. But, I wonder whether the book will have much impact on the progressive policy agenda in the United States. Last week, when Piketty was in Washington, DC, I attended one of his book events (at the Economic Policy Institute with co-sponsorship from the Washington Center for Equitable Growth) and watched another (at the Urban Institute) online. At those events, as in the book, Piketty warned that unless we can lower the rate of return to capital (r) below the rate of growth (g) in the overall economy, it will be very hard to block rising inequality in income and wealth at a national and a global scale. Piketty’s preferred policy for getting “r” below “g” is a steep, global, progressive wealth tax. At the first event, EPI’s Josh Bivens argued that one important implication of the book is that if we want to combat inequality, we should pursue policies that lower r by raising the bargaining power of workers relative to the owners of capital and what Piketty calls “supermanagers.” Among other options, Bivens specifically mentioned full-employment macroeconomic policy, increased unionization, and a higher minimum wage. These policies, he said, would “push r and g closer together” helping to reduce inequality. In her comments at the same event, Betsey Stevenson, one of the members of the Council of Economic Advisors, pushed policies that would raise the growth rate (g), including universal preschool programs and other measures. At the second event, my colleague, Dean Baker called for policies aimed at lowering the return to capital by greatly reducing economic rents in the financial sector and other parts of the economy that benefit substantially from various forms of government protections, including pharmaceuticals and health care. Back to my initial question: does Capital in the 21st Century point progressive policy in a new direction? Piketty makes one core recommendation: a high, progressive, tax on wealth, preferably implemented on a global scale to minimize evasion. I know very few on the left that would disagree with that as a policy goal. I know even fewer people of any political stripe who think that such a policy stands much of a chance of happening any time soon. By Piketty’s reading of his own book, however, nothing short of a global progressive wealth tax (or a repeat of a succession of cataclysmic events such as World War I, the Great Depression, and World War II) will be enough to prevent the further rise of inequality. Well, if Piketty is right, we push for a global wealth tax and the useful –but insufficient– policies that progressives have advocated for decades. If Piketty is wrong, we push for a –highly improbable– global wealth tax and the useful policies that progressives have advocated for decades. Let’s call this Piketty’s Wager. Source: Joe Rowley (Wikimedia Commons). Milla Sanes and I have a new CEPR report out today on the regulation of public-sector bargaining at the state-and-local level. 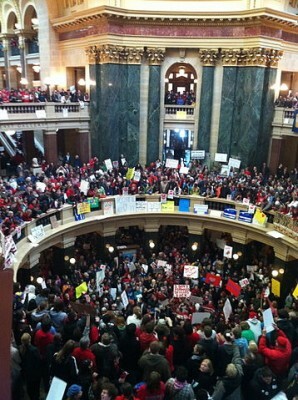 While the unionization of most private-sector workers is governed by the National Labor Relations Act (NLRA), the legal scope of collective bargaining for state and local public-sector workers is the domain of states and, where states allow it, local authorities. 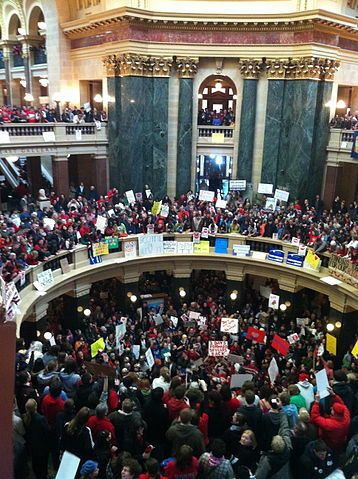 This hodge-podge of state-and-local legal frameworks is complicated enough, but recent efforts in Wisconsin, Michigan, Ohio, and other states have left the legal rights of public-sector workers even less transparent. In this report, we review the legal rights and limitations on public-sector bargaining in the 50 states and the District of Columbia, as of January 2014. Given the legal complexities, we focus on three sets of workers who make up almost half of all unionized public-sector workers: teachers, police, and firefighters, with some observations, where possible, on other state-and-local workers. For each group of workers, we examine whether public-sector workers have the right to bargain collectively; whether that right includes the ability to bargain over wages; and whether public-sector workers have the right to strike. We see the report as very much a work-in-progress. We plan to update the contents as we receive new information and as state law changes. Please let us know if you think we got anything wrong.